This week’s Smart Marketing Move of the week goes to TWO companies, Doritos and Pepsi. They have joined forces in radio commercials while both introducing a new sub-product. 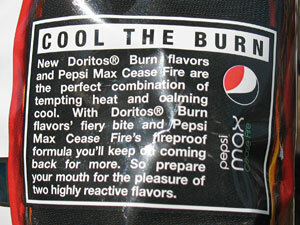 Pepsi now has Pepsi Max – Cease Fire, and Doritos now has 1st, 2nd, and 3rd degree burn flavors. 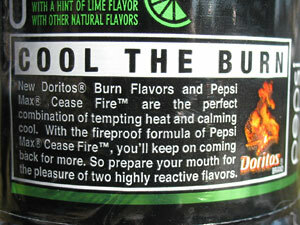 The commercial went something along the lines of a male calling into 911 because the Doritos he just ate were so hot, so 911 instructed the gentleman to use Pepsi Cease Fire, with lime, to cool him down. It got the point across and got my curiosity. Exactly what they were going for in this commercial! They even took the cross promotion further. They’ve included each product on their packaging. Smart! Although they are both owned by the same larger company, in consumer’s minds they are separate and that’s an even better reason to marry the two. Lesson Learned: Cross Promotion can be a powerful source that is untapped. 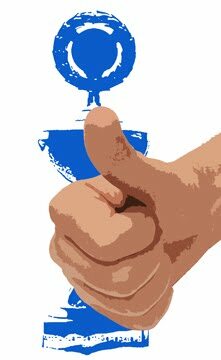 Even a small business can take advantage of this by partnering up with another local business where you will both benefit. Start thinking of your customers, where they shop, what they do and see if any businesses are interested in starting up a cross promotion. It could be your secret weapon.